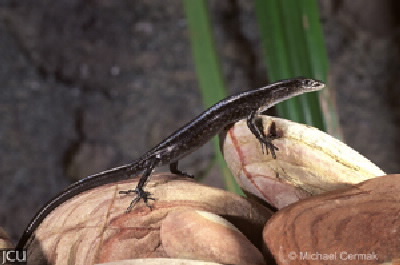 This skink is usually found in rocky areas close to foreshores but may extend back to the foothills. Distinguished by the lower surface of the feet being a shiny black. The dark body has an irregularly edged pale stripe on both sides of the back, it is often bordered with black or dark brown particularly near the head and neck. Numerous flecks and spots may be found on the main body; belly is a dirty white.